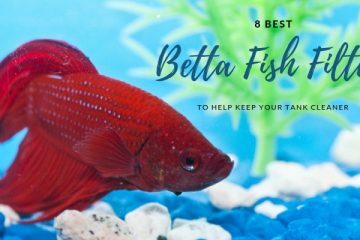 Whether you’re keeping tropical fish, goldfish or a saltwater aquarium, clear, clean water is essential for having healthy fish, plants and invertebrates. Canister filters are regarded as a step up from basic hang-on-back (HOB) aquarium filter. Aquarium canister filter systems are engineered to provide more effective filtration for freshwater and marine aquariums. Bigger is better with aquarium filters! Canister filters use a greater volume of advanced and specialty filtration media that remove toxins, improve water quality and maintain water clarity. The high flow volume of a canister filter is unmatched compared to other types of aquarium filters. 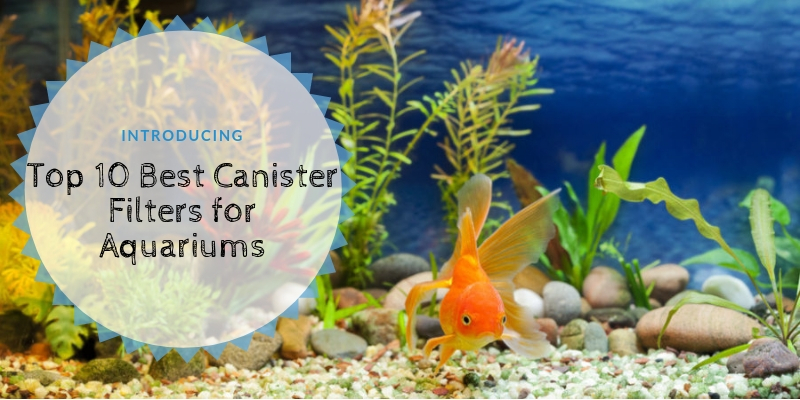 If you’re starting a new aquarium or just want to upgrade your filtration system, we’ve compiled a list of the best aquarium canister filters available today. Maybe you don’t know much about aquarium filtration. Don’t worry! We’ll explain everything you need to know to make the right choice! Are Canister Filters Worth The Upgrade? How Does A Canister Work? Which Canister Is Right For Me? You may be wondering what’s so great about canister filters. It’s true all aquarium filters circulate the water and filter the water, but that’s where the similarities end. Hang-on-back filters use a filter cartridge. The filter cartridge consists of a “pocket” made of synthetic fibers. Activated carbon, usually a very small amount, is added to the pocket. Water flows through the cartridge, where particles of debris are captured on the fiber pocket. The small amount of activated carbon will remove a trace of dissolved organics, color and odors, but not much. A Canister filter is a “no compromise” filter. The large canister holds significantly more filtration media. 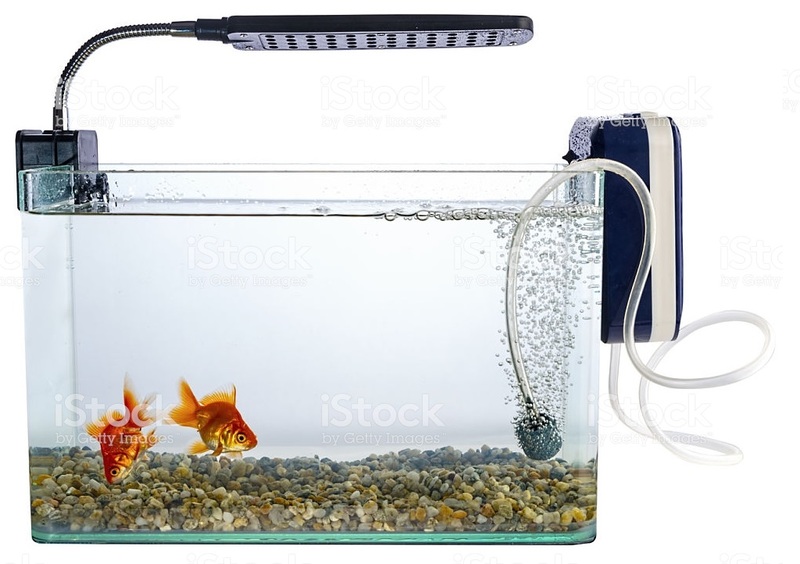 The bottom line is canister filters are able to capture more debris, circulate more water and remove more organic pollutants that discolor the water, cause odors and stress the fish, than ordinary hang-on-back filters. We’ve checked out a lot of canister filters. Here what we found out. Fluval is a brand famous for powerful aquarium filtration. 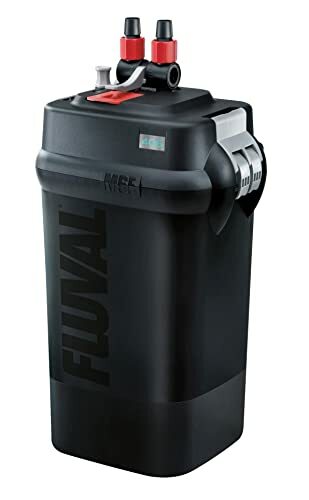 For over 30 years Fluval has been continuously upgrading their canister filter range to make them more powerful and efficient. The MSF logo stands for multi-stage filtration. Large media baskets stack together, providing stages of filtration. Each basket contains different filter media. Water passes through the baskets where the filter media remove particulate matter, dissolved organics, colors and odors. Biological filter media will remove ammonia and nitrite. A major complaint with less reliable canister filters is leaking seals. The Fluval 406 has been upgraded with reliable seals and quick-release hose connectors. Better seals mean the canister won’t leak. The Sunsun 4-Stage Canister filter has three stages of water filtration plus an ultraviolet disinfection stage. The Sunsun filter contains three filter media baskets that hold foam filter pads, activated carbon and biological filtration media. The canister has a square shape design. The Sunsun filter includes fine and coarse filter pads to remove particulate matter. It comes with one pound of pelletized activated carbon in a flow-through pouch. For biological filtration, the kit comes with one pound of porous ceramic rings. Sunsun even provides plastic biological filtration balls as an optional filter media. The fourth stage of filtration is the 9-watt ultraviolet (UV) light. The UV light kills algae cells as they pass through the filter. The UV prevents algae blooms and keeps the aquarium water clear. The UV light also kills pathogenic bacteria and parasites the cause fish diseases. The Sunsun 4-stage canister filter has a priming button making it easy to prime and start the filter. Just press the priming button to start the siphon that fills the canister. Once the canister if full of water, just plug it in. The filter begins working immediately. No more messy priming with spills! The Sunsun filter includes long hoses, spray bar and suction cups. 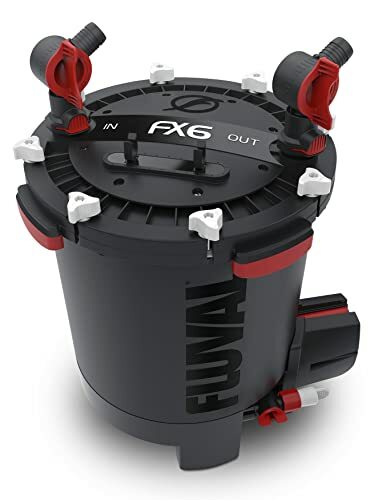 The Fluval FX6 canister filter is a large, heavy-duty aquarium filter. This Italian-made, state-of-the-art design has advanced features not found on other canister filters. If you’ve got a large aquarium or dirty fish, this may be your dream filter. The filter uses a round basket-in-a-basket design. The media baskets stack on top of one another like other canister filters but that’s where similarities end. The FX6 baskets each have an outer chamber and an inner chamber. All the baskets stack together. The aquarium water flows through each chamber of the baskets. The FX6 has six stages of filtration. The first stage uses FX pads which remove large debris. FX Bio-Foam pads remove fine particles and polish the water. Biomax filter rings are fired ceramic rings with internal pores for beneficial bacteria. Pre-cut FX carbon coated foam pads are specially shaped to fit in the round basket. The carbon filters remove odors, colors and dissolved organic contaminants. 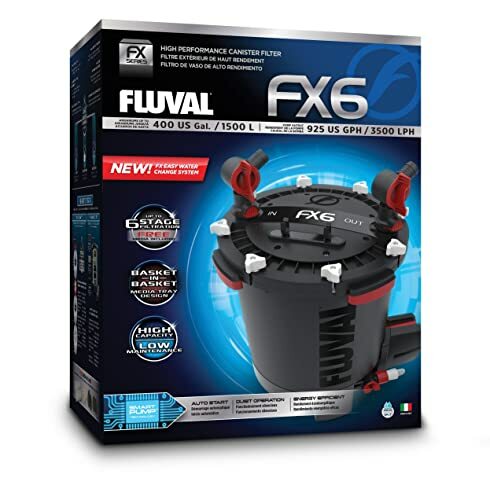 The Fluval FX6 uses patented Smart Pump technology. The pump automatically primes and starts the filter. The smart flow monitoring system automatically adjusts the pump to maintain a consistent flow rate. The digital sensors purge the canister of trapped air bubbles once every 12 hours. This prevents annoying air locks that can shut the filter down when you least expect it. This Hydor Professional canister filter uses the square shape design as found on other canister filters. The motor lid is held on by two large, wide clips. Rubber feet on the bottom of the canister reduce vibration noise and keep the filter in place. The water pump uses a ceramic pump shaft. This ensures smooth, quiet operation. The filter comes with long, kink-free tubing for easy routing behind the aquarium cabinet. 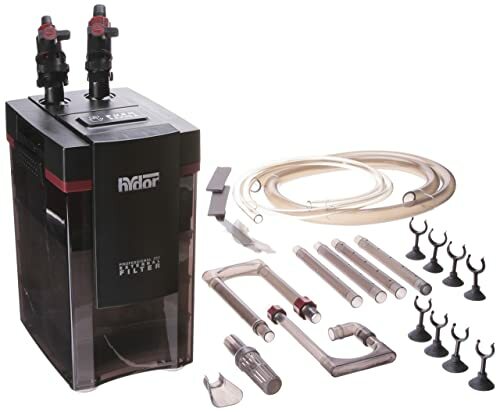 The Hydor Professional includes a spray bar attachment for aerating the water. Spray bars are not available on all brands of canister filters, so this is a plus! The water intake and spray bar are held in- with suction cups. The intake tube is telescopic, meaning it can be adjusted to different depths. Hydor included a push-button priming system to make start-up easier. Without the priming option, you’ll have to start the flow of water into the canister manually. Just give the primer button a push and the tank fills with aquarium water. Air is pushed out as water fills the tank. Just plug in the power cord to start the filter. For easy maintenance, the filter comes with quick disconnect valves. Unlike budget valves, the Hydor uses ball-valves for leak-free reliability. 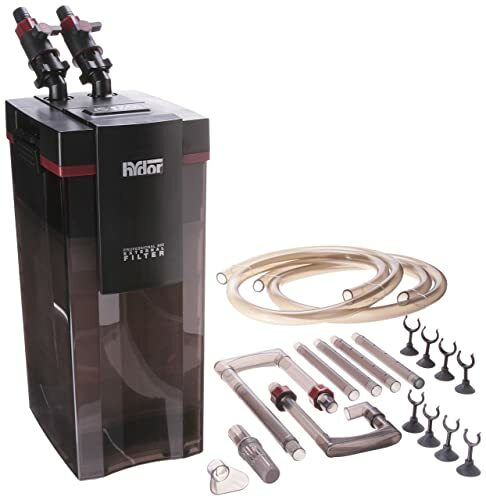 The Hydor Professional canister filter comes with pre-cut mechanical filter pads that fit inside the baskets. The filter also comes with biological filtration media. The Penn Plax Cascade 1500 model uses five plastic media baskets, stacked inside the canister. Pre-cut coarse sponge and fine filter pads capture floating debris and water-clouding particles. A flow-through bag of ceramic bio-filtration media is included. A pouch of granular activated carbon also comes with the filter kit. The Cascade 1500 provides multiple stages of filtration using PennPlax media or you can use your own. Rotating, quick disconnect valves make it easy to bring the canister to the sink for cleaning. The Cascade’s valves rotate 360 degrees, making it easy to route tubing from the tank to the canister. The outflow valve can be used to reduce the flow rate during feeding. This will prevent food from being sucked into the filter. Maintenance is simple and quick. Just unplug the motor, close the valves and carry the filter to the sink. The nesting baskets have a handle for simplified media changes. The PennPlax media drops right into the baskets. No cutting or filling media bags. The Penn Plax Cascade 1500 has a one-push priming button. Just pump the button once to fill the canister with water. Four locking clamps hold the lid tightly to the canister tank. The filter includes tubing, inlet and outlet pipe, spray bar and a directional nozzle. The model 600 Hydor filter has many of the same design features of the smaller 250 model. It’s rated for 90 to 150-gallon aquariums. The filter canister is taller, measuring 23.6 inches tall. 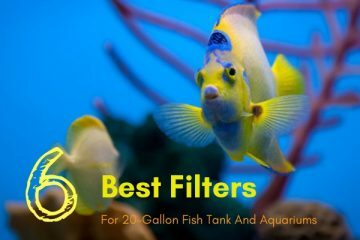 Be sure this tall filter will fit under your aquarium cabinet! The taller 600 model holds more filtration media. There’s plenty of room to add more filter pads to the baskets, polishing the water to crystal clarity. More baskets mean more activated carbon, ammonia remover and other specialty filter media can be loaded into the filter. Speaking of filter media, look at what comes with the filter. The Hydor 600 uses five filter media baskets. The filter comes with filter pads that capture fine particles that cloud the water. Foam sponge filter pads capture larger debris. These can be rinsed and reused again. Ceramic biological filtration rings are supplied in a flow-through bag. 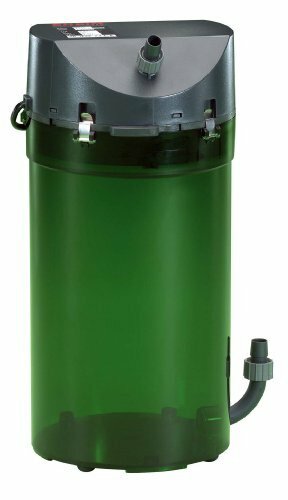 The Hydro 600 Professional Canister filter has a larger-capacity motor. Water flow capacity is 345 gallons per hour. This gives the Hydor filter the 90 to 150-gallon tank rating. In real life use, the filter is probably limited to aquariums up to 100 gallons. Eheim is a German aquarium filter company famous for high quality products. The Eheim Classic external canister aquarium filter is a basic design compared to other Eheim models. But that doesn’t mean you ignore this workhorse of an aquarium filter! Look what the Eheim Classic canister filter has to offer. The Classic does not use media baskets. Instead, filtration pads and granular media are placed directly inside the canister tank. For over twenty years this design has proven simple and effective even for the most demanding aquarists. Take a look at the media choices for the Eheim Classic. For mechanical particulate removal, Eheim MECH mechanical filter media is included with the filter. You can rinse this media and use it for many years. The Classic canister comes with Eheim SubstratPro, which is a granular media designed for beneficial bacteria (ammonia and nitrite removal). Activated carbon filter pads are not included but can be purchased separately. The Eheim Classic comes with high-quality accessories. The Eheim Classic canister filter comes with a pair flexible hoses, a spray bar, and an inlet pipe. Eheim is famous for flexible tubing and outstanding suction cups for mounting the hose system in the aquarium. The filter uses two-piece shut-off valves that make cleaning the filter easy. Rated for aquariums up to 95 gallons. The AquaTop CF canister filter (525 GPH model) is a traditional canister filter with a twist. It combines multiple stages of filtration with a powerful ultraviolet light, all in one filter. The AquaTop CF filter has a push-button priming system. A quick press of the button starts a siphon, filling the filter tank with water. 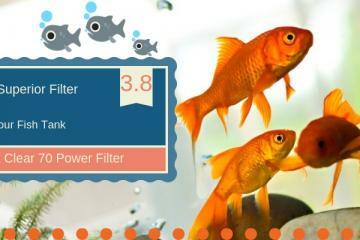 This feature-rich aquarium filter is worth a closer look. Like other filters we reviewed, the AquaTop CF uses a quick-disconnect shut-off valve. The hose barbs have easy to use nuts to secure the hoses. The barbs even rotate to make hose routing easy. Speaking of hoses, the AquaTop canister filter comes with long hoses, giving you plenty of room to set up the filter under your aquarium. The AquaTop CF canister filter has four baskets, that nest together. Each basket has a handle for easy stacking and cleaning. You have the option of using AquaTop filter media or your favorite brand of activated carbon, resin blend, phosphate remover or biological filter media. 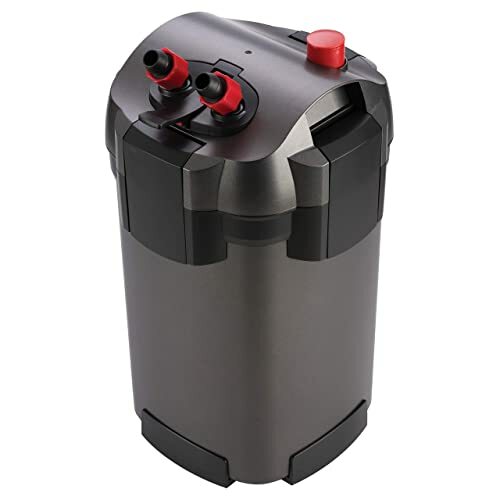 Check out the AquaTop media included with the CF canister filter. The CF canister filter comes with one coarse sponge filter pad to pre-filter larger particles. Three fine micro-filtration pads are included for water polishing and extra-fine particulate removal. AquaTop also provides activated carbon, ceramic rings and plastic biological filtration balls. The final stage of filtration is UV sterilization. The AquaTop CF has a 9-watt ultraviolet (UV) light inside the canister. The UV light kills algae cells in the water. The UV maintains clear water by inhibiting “green water” algae blooms. 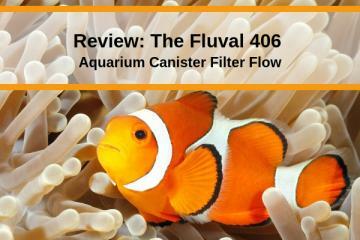 The Magniflow model 360 canister filter is rated for aquariums up to 100 gallons. It uses the square canister design with Stack-N-Flo filter trays. The Magniflow range of canister filters have a quick prime button that makes start-up easy. No more sucking on a hose to start the filter! But there’s more! The Magniflow canister filter is constructed of high-quality plastic that won’t warp or flex. This means the lid seals properly to the canister, eliminating leaks caused by inferior plastics. A premium O-ring is used to seal the canister closed. This is important because flimsy O-rings gradually lose their ability to prevent leaks. The quick release valve block immediately shuts off the water flow and separates the hoses from the canister for spill-free filter maintenance. There’s plenty of filter media included with the filter! The canister comes with two foam filter pads to screen out dirt and debris. You’ll also get Black Diamond activated carbon comes in a flow-through pouch. Next comes a combination of ceramic rings and plastic bio-balls to keep the water ammonia and nitrite-free. The last stage is a fine filter pad that polishes the water, ensuring crystal-clear water. Want more features? The Marineland Magniflow 360 comes with long, kink-free tubing, inlet and outlet pipes, suction cups and nozzle. It’s easy to set up and get running. The Magniflow 360 comes with everything you need. The API Filstar canister filter range has lots of unique features. The Filstar has a patented quick disconnect valve. A flip of the lever shuts off water flow and disconnects the hoses from the canister. Built-in handles make it easy to carry the canister to the sink for cleaning. Soft, rubber feet dampen vibrations for near-silent operation. But what about filter media? XP filters come with two types of foam pads. The coarse foam pad (20 pores per inch), removes large particles. The fine foam pad (30 pores per inch) removes tiny particulates. XP filters also come with Bio-Chem Zorb, a blend of premium activated carbon and adsorption resins. Bio-Chem Stars are biological filtration media made of porous plastic. The Stars have a 50-micron pore network, providing a protective environment for beneficial bacteria. A final polishing filter pad that makes the water sparkling clear. The API XP canister filter comes with six-foot silicone hoses for easy routing behind the aquarium. The inlet and outlet fittings are sturdy and are attached to the tank with suction cups. There is no spray bar option. The first thing you need to know is that canister ratings are exaggerated! 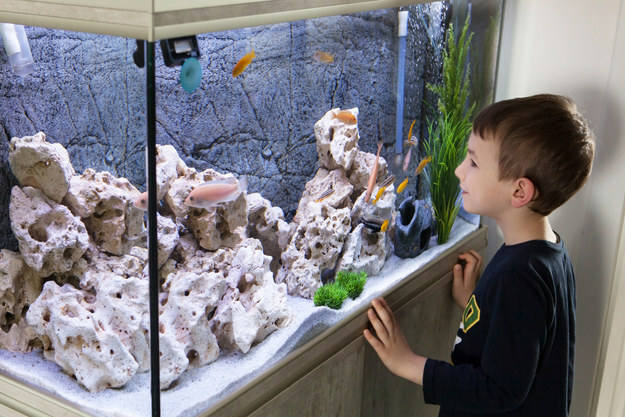 A canister rated for a 100-gallon aquarium might be adequate if the aquarium contains a few fish and gets frequent water changes. In reality, this canister filter is best suited for a 55 to 75-gallon aquarium. Filter manufactures often try to gain market share by inflating gallons treated specs. Want to know the truth about flow rates? The filter flow rates, provided in gallons per hour (GPH) and liters per hour (LPH), are based on using the canister filter with no filter media in it. This is an industry standard, but it can be misleading to aquarists comparing filter specifications. Some filter manufacturers provide a flow chart showing actual flow rates based on how high the water is being pumped to the aquarium. The taller the tank, the lower the flow rate per hour. Now you’re ready to look at types of filtration. Chemical filtration media removes ammonia, nitrite and nitrate and dissolved organic compounds that discolor the water. Ammonia is a toxin released by fish as a waste product. Ammonia-removing zeolite media will remove ammonia in freshwater. Dissolved organics produce a yellow color in aquarium water. Activated carbon adsorbs organics, keeping the water clean and clear. Here’s the media you can use in a canister filter. Granular activated carbon (GAC) adsorbs dissolved organic pollutants. Organic pollutants can increase the chances of fish disease problems. Activated carbon has tiny pores that trap organic chemicals inside the porous network. Phosphate removers target inorganic phosphate. Phosphate is an algae-promoting nutrient that naturally accumulates in aquarium. Too much phosphate promotes algae growth on the gravel and glass. Ammonia removers only work in freshwater aquariums. The granular material is a specialty media that only removes harmful ammonia. Zeolite ammonia removers won’t work in saltwater due to the high level of sodium in sea water. Nitrate removers reduce the level of nitrate, the end-product of biological filtration. Many aquarists like to keep nitrate as low as possible. Biological filtration is the natural process that converts toxic ammonia into nitrite (also toxic) and nitrite into harmless nitrate. It occurs in all aquariums. Biological filtration is performed by beneficial “nitrifying” bacteria. Nitrifying bacteria attach to solid surfaces like gravel, plastic plants, live plants and on filter surfaces. Canister filters usually come with one or two kinds of biological filtration media. The idea is to provide more surface area for the bacteria to attach to. Biological filter media comes in several forms. Some filters have an ultraviolet light built into the canister. The feature is called UV sterilization, but it is not exactly correct. The low-wattage UV bulb won’t sterilize the aquarium. The UV light won’t do much to control bacteria and parasites that cause fish diseases. The light is not powerful enough to make a significant difference on these microbes living in the aquarium and on the fish. The good news is UV lights will kill algae cells that pass through the filter. They’ll help keep the water clear. Now that you know the basics, we can reveal some canister secrets. Here’s what you need to consider when choose a canister filter. As we discussed, the actual flow rates are less than what the specs say. Consider choosing the next size filter model to achieve the water quality you desire. Long hoses make it easier to set up and clean the canister filter. Silicone tubing is best. Look for canister filters with thick clamps to lock the lid onto the canister. The thicker clamps resist breakage and hold the lid on more securely than light-duty clamps. Rubber feet on the bottom of the canister reduce vibration noise. Check the warranty. Some manufacturers have three-year warranties, other only one year. Replacement parts can come in handy if your filter needs a repair. Not every brand offers replacement parts. The idea behind a canister filter is to pump aquarium water through a series of specialized filtration media. Unlike hang-on-back (HOB) power filters, canister filters hold a lot more media. The canister is used to contain the filter media while water passes through it. Dirty water flows by gravity from the aquarium and into the canister. The water pump motor is molded into the lid of the filter. The pump pushes the filtered water back to the aquarium. Aquarium water leaving the canister filter should be cleaner than the water entering it. The canister lid is seated onto the canister tank and held secure by clamps. The lid uses an O-ring to seal the water in and air out of the canister. The shut-off valves prevent water in the aquarium from back-siphoning when the tubing is removed from the canister. It also helps when disconnecting the filter for cleaning. You won’t lose the siphon. This is a major improvement from earlier canister designs. Canister filter models come in various sizes and the flow rates. Larger filters require higher flow rates to handle the needs of big aquariums. That’s why manufacturers rate their filters by gallons per hour and aquarium size. Aeration is important in freshwater and marine aquariums. Oxygen enters aquarium water through surface agitation. Carbon dioxide gas leaves the water at the surface. All canister filters use some style of water return outlet to stir up the water surface. Spray bars and nozzles are the most common options. Water movement diffuses excess carbon dioxide and increase oxygenation of the water. Are There Freshwater And Saltwater-Safe Canister Filters? No. All of today’s canister filters use saltwater-safe components. How Often Do I Need To Change My Filter Pads? Mechanical filter pads and sponges should be washed or replaced every thirty days. Mechanical filtration can clog even sooner if the water is very dirty. How Long Does Activated Carbon Last? Most of the adsorption activity of activated carbon is used up in three to four weeks. Can I Use A Canister Filter With A Planted Aquarium? Yes. Canister filters work very well for creating water movement and cleaning the water. Do I Have To Replace The Biological Filtration Media? No. Plastic media and porous ceramic do not need to be replaced. The bacteria have more room than they need, even on somewhat dirty bio media. Just rinse the media in aquarium water if they get dirty. Should I Turn My Canister Filter Off At Night? No. The filter must run 24/7. It provides aeration for the fish and the bacteria responsible for biological filter in the aquarium. My Canister Filter Won’t Start Up. What Should I Do? The instruction manual will describe the proper-start-up process. It should also include a trouble-shooting section. My Canister Sends A Burst Of Bubbles Into The Aquarium Every Few Minutes. Why? If the filter has been running for more than 24 hours, chances are air is getting into the canister. Make sure the intake hose is secure on the canister and intake pipe in the aquarium. Re-seat the canister O-ring if necessary. 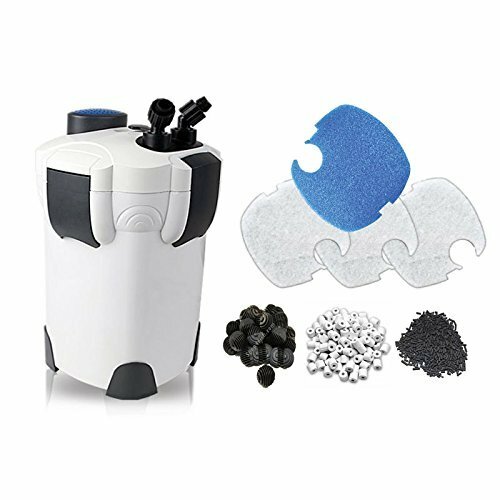 Will A Canister Filter Remove The Sludge In My Aquarium Gravel? No. Use a gravel siphon to remove organic sludge from the aquarium gravel bed. My Water Is Yellowish. Will A Canister Filter Help? Yes. If the canister contains activated carbon, it will make the water crystal clear. Can I Use Two Canister Filters On My Aquarium? Yes. Many aquarists use two canister filters in they have a large aquarium. I Have Large Cichlids That Create A Lot Of Solid Waste. Will A Canister Filter Help Keep The Tank Clean? Yes. A canister filter has more mechanical filter area and will help to keep the water cleaner. My Canister Filter Came With Biological Filter Media. Do I Need It? The main location of the bacteria that comprise the bio-filter is in the aquarium. Biological filter materials are optional on a properly set-up aquarium. Do I Have To Use The Filter Media That Came With My Canister Filter? No. You can use any type or brand of replacement filter media. As long as it fits in the filter, it will work. The Power Cord On My Canister Filter Is Damaged. Can I Replace It Myself? No. The original power cord and connection to the motor is made to be water-proof. Any DIY connection will be unsafe and could cause a fire or accidental death. Can I PlaceThe Canister Above My Aquarium? No. Canister filters are filled with water by gravity. Water does not flow uphill, so it won’t work. 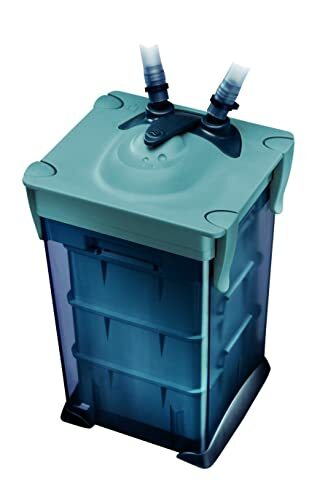 Will A Canister Filter Work With A Turtle Tank? Yes. But the filter must be placed below the turtle tank for it to run properly. 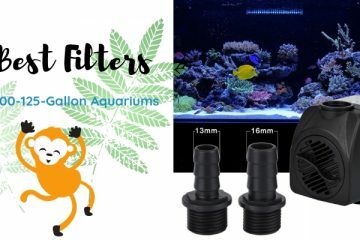 The filter must be located below the water line in the aquarium. Can I Use A Canister Filter On My Indoor Pond? Yes. The filter must be below the water level to function properly and retain a pump prime. Is It OK To Use A Canister Filter On A Reef Tank? Yes. All canister filters use saltwater-save components. A canister filter will provide good water flow and hold a lot of specialty media popular with reef enthusiasts. Will A Canister Filter RemoveFish Parasites? No. Parasites are microscopic and pass through filter media. 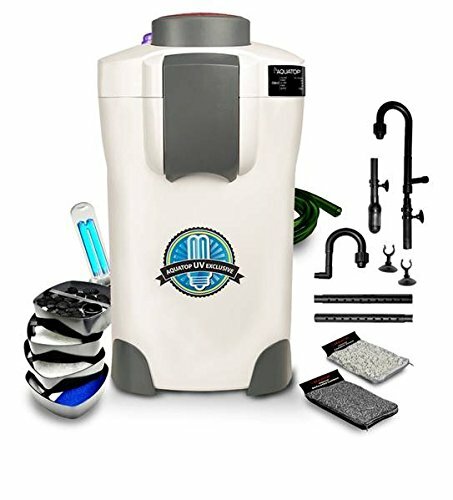 Will A Canister Filter Make My Water Too Clean? No. That is myth about many types of filtration. As we’ve seen, there are many brands and styles of aquarium canister filters. Not every brand offers the same feature mix. The best approach is to compare the features you value most. If you don’t require media baskets and just want a basic canister filter with proven reliability, the Eheim Classic range of canister filters may be just what you’re looking for. Aquarists with large aquariums will appreciate the Fluval FX6. It’s big, powerful and works overtime to keep the aquarium clean. Don’t forget to take a close look at the API Filstar line of canister filters. You’ll have the convenience of media baskets and reliability of a quiet French-designed motor.